For the truly adventurous, you can make your own gnocchi, which are after all just dumplings made from potato and not disimilar to quenelles. Gnocchi are a delicious starter with tomato sauce, cheese sauce, pesto, or just butter and cheese. 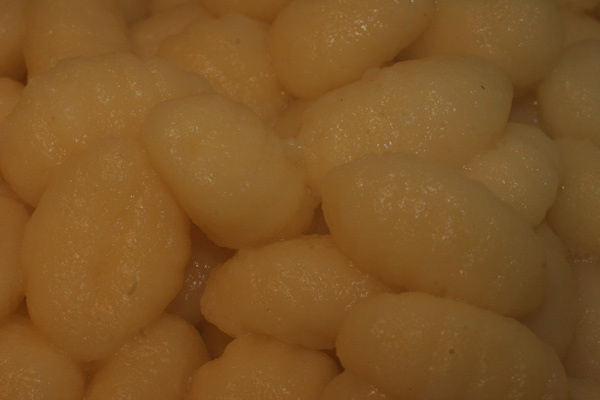 They would also make a mouthwatering main course if gnocchi were not so much work to prepare in large quantities. Boil the potatoes in a large pot for about half an hour making sure they have enough room to move around. Drain and allow to cool enough to handle. Still-warm potatoes work best for this recipe. Scrape off the skin with a paring knife, then slice using a food mill with a narrow-opening disc. In a small bowl, beat the egg and add flour, then sprinkle with cheese, salt, pepper, and nutmeg. Work the mixture into lumpy balls. Cut into dumplings about 1/2 inch thick, working them with a fork to the proper shape - a short, fat, twisted, solid tube. In a large pot, add 6 quarts of water and bring to a boil. Drop the gnocchi dough in and stir gently to keep them from sticking to one another. Cooking should take only a minute or so. You can use leftover potato mash to make gnocchi, if it is dry enough. 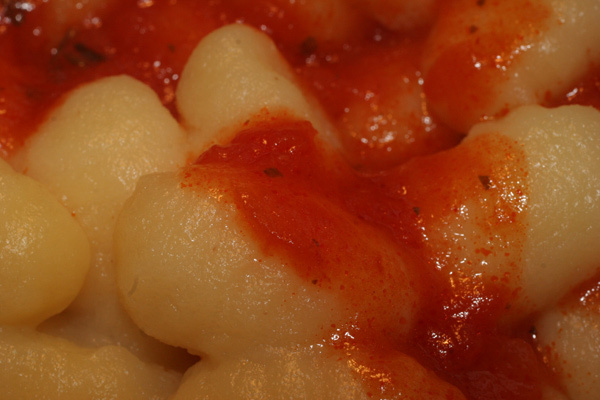 Mix a little pureed tomato or spinach with the potato dough to make colored gnocchi. Do you want even more variety? Place some filling in the middle of your gnocchi. Grated cheese, cooked spinach or mushrooms, diced cooked ham, finely chopped herbs make great fillings for gnochhi. 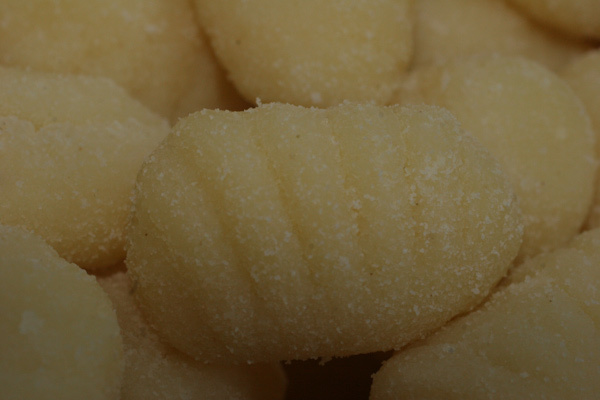 You will also find recipes for Italian gnocchi made only with semolina. These are usually served on the side to a meat dish, although they are also delicious on their own, just dotted with grated cheese and butter and cooked under the grill.